This aircraft had extraordinary performance on small runways and aft air stairs for passenger loading/unloading, making it perfect for smaller satellite airports that the other airliners couldn’t fly into. The T-tailed, trio rear-mounted engines on the 727 was the first of its kind in many categories. It was the first airliner to have an auxiliary power unit (APU), completely powered flight controls, triple-slotted Kueger flaps, the first Boeing jetliner to undergo rigorous fatigue testing, and the first commercial airplane to break the 1,000-sales mark. Of these firsts, it was the APU which gave this aircraft its freedom to fly to airports that didn’t have ground power or starting equipment. Add in the fact that this aircraft had extraordinary performance on small runways and aft air stairs for passenger loading/unloading, and you have a commercial transport aircraft that could get in and out of smaller satellite airports that the other airliners couldn’t fly into. I was fortunate enough to fly in all three seats of the Boeing 727-200. Yes, there was an engineer on this aircraft and that side seat was a great place to learn about the airplane and crew resource management. There are some modifications and hush kits flying out there, but the aircraft fleet I flew generally had a max takeoff weight of 197,000 lbs, a range of 2200 miles (+/-), could carry 60,000 lbs of fuel depending on the optional fuel tanks, and could reach Mach .9 in a heartbeat (a great plane to learn about Mach tuck/buffet), but it burned so much fuel the company encouraged .78. The fleet was configured with high density passenger seating so we were able to cram in 173 passengers. Pratt and Whitney powered us with their slightly higher bypass ratio JT8D-17 engines and to say they were loud was an understatement. They made the earth tremble, set off car alarms, and triggered many noise abatement fines at airports that had sensitive areas. It was because of this aircraft’s ability and features that I got to fly into some of the strangest places. Because we didn’t have to rely on ground services and could perform out of small and high altitude runways, the company I flew for could accepts Part 121 Supplemental charter contracts for some weird destinations. Just a few of the unusual charters included flying foreign tourists in and out of Angel Fire airport to tour the Grand Canyon, the WWF wrestlers (back when they were the WWF) all over small towns in the Northwest, college and professional sports teams from coast to coast, Hot Shot firefighters from Alaska to airports up and down the west coast, high altitude mountain airports, and we were one of the first flights in the air after 9/11 flying down to Guantanamo Bay, unaware of the importance of our passengers. The Boeing 727 was forgiving and gladly did most anything you demanded of it, but it didn’t keep any secrets. It would tell the next pilot if the previous pilot had been naughty, especially on takeoff. This aircraft had a retractable tailskid which was equipped with an energy absorber consisting of a cylinder with a crushable honeycomb core. If the clip was sheared off because of a tail skid strike, it would be retained by the wire and red area beneath the clip would be exposed to indicate that the core had been crushed. There was also removable paint on the tailskid so you could easily see if paint was missing and this inspection was on the checklist for the walk-around inspection. Tail strikes usually happened if someone over-rotated on takeoff, often when they were heavy with a good crosswind or when the aircraft was empty and wanted to launch into the air like a rocket. There are reports of it happening on landing, but it would have to be a pretty bad landing. This tailskid is retractable and has its own warning light on the flight engineer’s panel. If it didn’t retract with the gear, there was a high penalty fuel hit if you chose to continue the flight. The cockpit has three pilot seats and two full size jump seats, so this was the choice of many commuters trying to catch a ride. 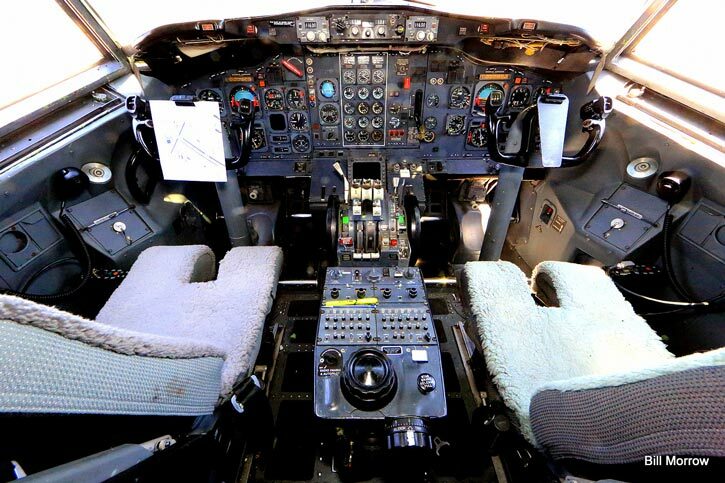 There are four seats on the Boeing 727 that sit sideways: three of them are toilets and one is the engineer seat. I still have a dent on my knee from a first officer slamming his seat backwards without warning me when I was a flight engineer, and I earned a few bruises from the trim wheel in the first officer seat when the captain decided to spin it like a power saw. Put three pilots in a cockpit on a long flight and they’re bound to come up with ways to annoy each other. A few underwear changes were the result of another pilot snickering while they activated the stall warning stick shaker test during flight if one of the other pilots was spending too much time checking out the inside of their eyelids. Often, an engineer who felt some disrespect back there could put a touch of aileron trim in while the autopilot was on. When the autopilot was on, the rudder trim worked, but the aileron trim was locked out. When you popped off the autopilot, it would put all that aileron trim back in…immediately. In flight, there were generally three speeds you needed to know: 140 knots, 250 knots and just below the barber pole. If you lost all your performance charts for landing, you couldn’t go wrong with 140 knots on short final, 3,000 pounds fuel flow and flaps 30. When the sun was out, the overhead windows would bore burn holes into your skin, so most of these windows were filled with enroute charts. Since there is no sidewall heating in the cockpit, by the end of most flights, you had a sweater on and you could still see your breath. We had one aircraft that had collapsed/blocked heat ducts in the cockpit and they refused to fix it so we’d be up there in our heavy winter coats, scarves and mittens and wishing we could keep the cockpit door open for just a few moments of warmth. We’d call the flight attendants in for hot coffee and keep the door open as long as possible. One of the Boeing 727’s quirks was that it required a slightly different touch to get a great landing. Contrary to thousands of previous hours in other airplanes, this aircraft required you to put the nose down just a little right before touchdown. If you’d flatten for just a moment, then the heavy aft fuselage would touchdown and do the landing for you. It would even brake automatically and auto speedbrake if you asked it to. I remember the first time I saw a pilot land with the autobrakes on the medium setting instead of minimum. It put us all forward in our seatbelts as soon as the wheels started spinning. I never saw anyone use the “max” setting except in the sim. The Boeing 727 was originally designed to have nose wheel braking as well, but most of these brakes had been removed. There are a few theories as to why, but as far as I could tell, we never needed them. During simulator training, we got to wring out this airplane in every way possible. We loved putting this aircraft into every variable of dire emergency situations you could think of. The last emergency of my check ride training was always the classic three engine failure. With a glide ratio around 17:1, this meant for every mile above the ground, I could glide 17 miles forward. Wasn’t always pretty, but I made it to the airport runway every time. 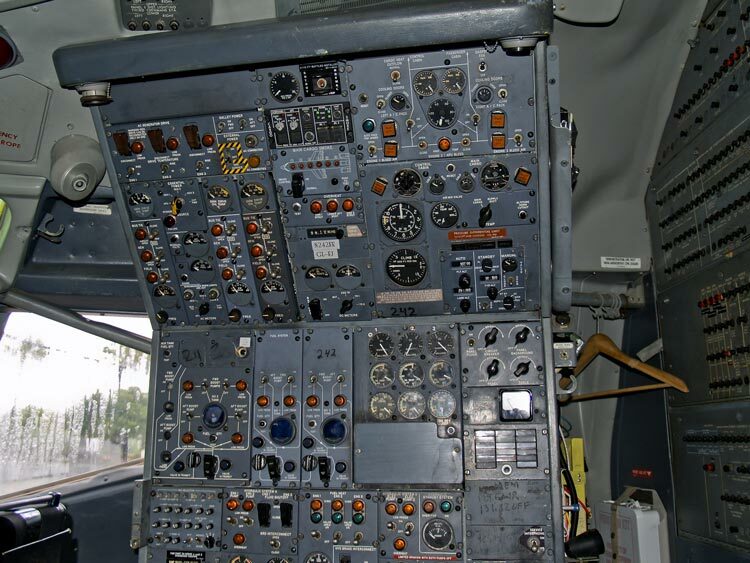 We all cringed when we had to practice procedures like the dreaded manual gear extension, heaving the controls around without hydraulics, and shooting approach on essential or emergency power. In the real world, we always had a long list of MELs (which always seemed to include the autopilot), but this airplane always got the job done. I only had two events which would be considered emergencies (that weren’t pilot induced). Once when we were struck by lightning (but even then, the airplane shook it off and got us home safely) and once when we shed a fan blade on the N1 compressor section of the #2 (middle) engine during takeoff. The engine shroud contained the shrapnel and we got to spend an extra day in Mazatlán. Overall, this airplane established a relationship with the pilots who flew her. She didn’t have computers making decisions for you (for better or worse) and the controls felt like you were actually maneuvering an airplane. She was stubborn, but once you learned to work with her and not against her, she’d do anything you asked. The Boeing 727 was simply trustworthy and solid. This refined, pure relationship created a connection between (wo)man and machine and we all learned to respect her. 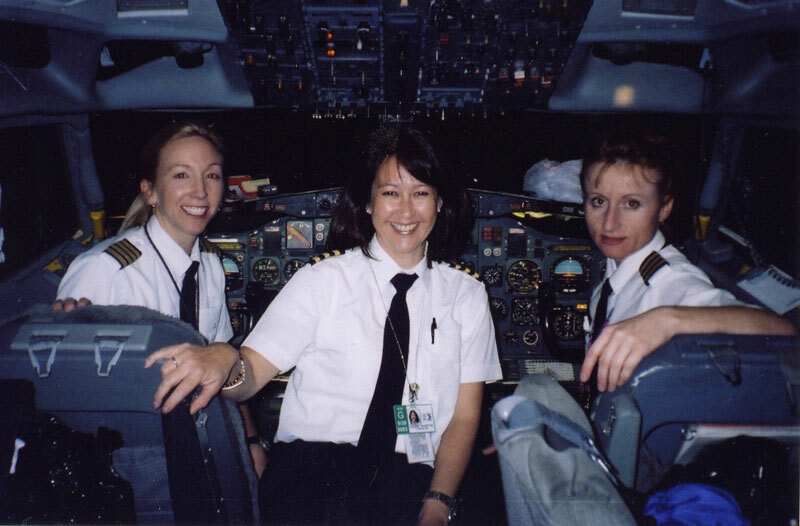 So, as the last 727s make their last landings over the next few years, let’s lift a glass (or two) to the friendships she created, the lasting memories of the pilots who flew her, and the enormous number of hearing aids she will require us to buy in the future. Great article, Erica. I loaded MANY -27’s when I worked as a Ramp Agent for FedEx at the Memphis hub. Flew many thousands of miles in one of the cockpit jump seats. Even though not a pilot, I still love the old girls! Hi Erika, another great article by the way. I could easily tell you had had a “special chemistry” having flown this aircraft. It reminds me of your article on “Zen and Pilots”….or something of that sort!! Hope I got the title right..!! Anyway, I bet anyone considering flying an airliner would jump right into a B727 soon after reading this article….! Personally, I would, just to experience everything you’re mentioned first hand. Sounds like fun!! Enjoyed the article and the memories. I flew right seat on the “3-holer” for 3 years and had a great time. During the winter months I was perpetually cold but only on my right side while my left was toasty. I enjoyed reading your article. I know Tim Powell, the pilot who flew the restored UAL N7001U, S/N 18293, the first Boeing 727 built. The flight was from Paine Field, Everett, Washington to the Museum of Flight at Boeing Field, Seattle, Washington on March 2, 2016. The airplane was restored at the Museum of Flight, Paine Field by a dedicated crew of volunteers under the leadership of myself starting in March of 2004. The final refurbishment was at Aviation Technical Services (ATS) with the great team of SOAR. Many other companies and individuals donated parts, etc. Great and creative writing! It brought back several 727 memories for me, especially the rear staircase. As a young lawyer in the ’90s, I often flew DC to New York on the USAir(ways) shuttle. Once in a while I would deplane from the rear onto the tarmac. There, with the blowing wind, the smell of jet fuel, the bright sun, and the Manhattan skyline in the background, I really thought that I had made it. Jetways don’t hold a candle to that. I remember attending US Navy boot camp in San Diego in late 1991 and the the 727s taking off out of Lindberg field would go overhead it hurt your ears they were so loud. I have also flown in all three seats of this marvelous aircraft. I will always have fond memories and also a few scary times, but will never say a bad word about this flying machine. I have close to 15000 hours flying as 1st Officer and Captain, not counting approximately 6000 hours as FE. I do miss this marvel.